When it comes to Deer Stags, this company has been manufacturing high quality shoes for both men and women ever since 1929. With more than 9 decades of experience, this manufacturer has produced a wide range of footwear for almost any occasion. From stylish to classic, and casual to dress, this brand knows what it takes to produce a high-quality pair of shoes. Talking about the Deer Stags Men's Williamsburg Oxford, it is no different. Extremely comfortable, these men’s dress shoes are basically designed for workers who need to spend a considerable amount of time in their shoes every day. Lightweight construction makes sure that even if you wear them beyond your 9-5 routine, these Deer Stags Williamsburg men’s oxford shoes will help you stay protected from any unwanted foot fatigue. Featuring a lace-up closure, the Deer Stags Men’s Williamsburg Oxford incorporates a synthetic upper which is a great benefit for those customers whose jobs involve a fair amount of time standing. As compared to natural leather, synthetic leather is much lighter which you’ll appreciate when you’re working long hours on your feet. As a result, this shoe won’t weigh you down, helping you to better concentrate on the job and not feeling exhausted at the end of your day. When it comes to work, you just can’t afford a pair of shoes which lack a proper level of cushioning. While they will distract you throughout the day, an uncomfortable pair of shoes will also inflict unwanted foot fatigue. In order to make sure that these issues don’t exist with their products, Deer Stags has made use of a highly comfortable insole inside their shoes. This insole imparts a decent level of cushioning along with moderate arch support which helps you get through the day without your feet being in pain. Having said that, this isn’t a removable insole which might be a problem for some customers who are accustomed to using dress shoes with their own, customized insoles. At a time when many other oxford shoe brands come with rubber soles, the Deer Stags Men’s Williamsburg Oxford is an exception as they come with a synthetic outsole. The reason behind this exception lies in the fact that as compared to rubber, synthetic leather is generally more durable. You can use it for hours every day and it won’t tear apart. Moreover, this outsole has the tendency to conform itself to the shape of your feet which eventually results in a comfortable experience for your feet inside these shoes. It is also super quiet when it comes to walking on different types of floors. However, one thing which seems to be an issue with these shoes is their traction. On a slippery surface, these shoes tend to struggle when it comes to wet or uneven surfaces. However, if your job involves a regular office work environment, these shoes should be fine. While a tall heel might be a good choice when you’re looking to make a bit of a fashion statement, this is not the case when it comes to choosing dress shoes for your work. When you need to spend 8+ hours every day inside this product, anything slightly uncomfortable can end up developing into painful blisters on your feet. Keeping that in mind, the Deer Stags Men’s Williamsburg Oxford comes with an appropriate heel height of 1’’. Combine that with the 0.5’’ platform and you can forget about any kind of foot discomfort due to too high a heel. 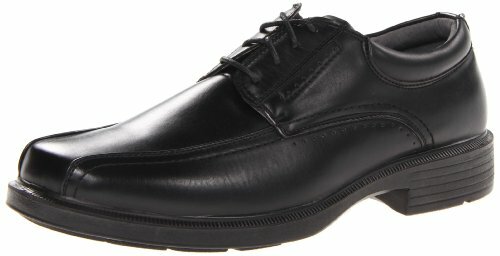 The Deer Stags Men’s Williamsburg Oxford incorporates faux leather upper along with a snug lace-up closure. The manufacturer has employed synthetic lining – for added breathability – along with a cushioned insole for all-day comfort. As per the synthetic outsole, it’s designed to retain its shape and won’t tear apart even after intense use. Furthermore, the traditional black design makes it a perfect match for a wide range of work situations. If you’re looking to purchase a pair of shoes without straining your bank balance, the Deer Stags Men's Williamsburg Oxford holds a decent value for money. 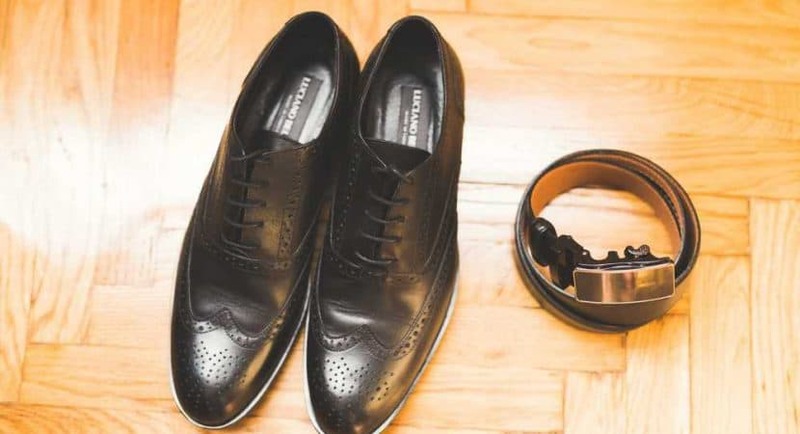 Nowadays, when you’re often faced with spending a substantial amount of money for getting a good pair of men’s work shoes, these shoes will do the job well and at a very reasonable price. However, if durability is your main concern and you’re looking to purchase a model which can last for years to come, this might not be the perfect product for you. In that case, you’ll need to consider increasing your budget in your search for better quality, more durable pairs of shoes.